« The Kids Are Going To Be Alright… and the dogs too. Everyone’s Going Back to School Except Me- Weird. Today has been a very strange day for me. All day I have been going through the motions but I have been feeling like I am missing something. It is the day after Labor Day or Labour Day if you are Canadian, and that is the day that I usually start back to work. But today I didn’t. For the first time since well, I guess since I was four, I did not start school today. I have always gone back to school in September, as a student and then as a teacher. Last night I actually had a good night sleep. Normally I can’t sleep the night before school because I am excited to meet my students and I have the first day jitters. Not last night, I slept like a log. It was weird. 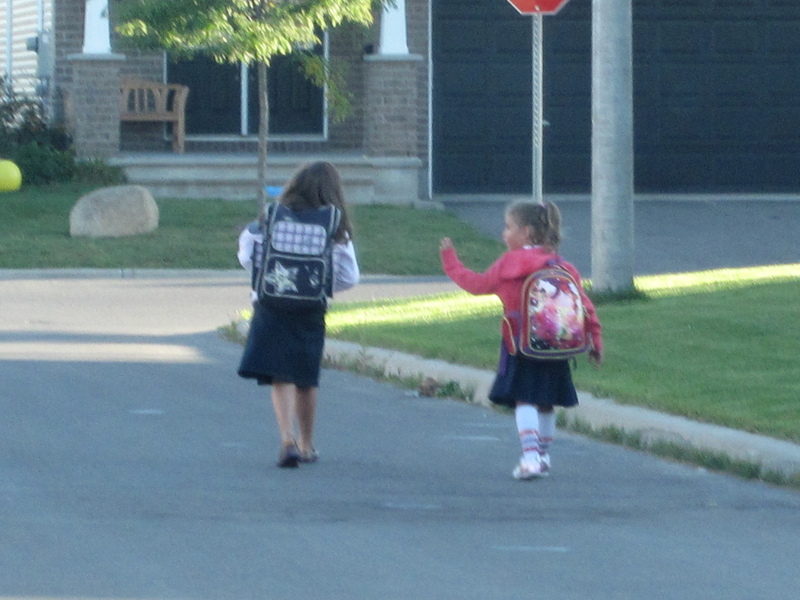 My girls don’t start school until tomorrow- It’s a NYC thing. So, we spent the day in Central Park meeting kids from A’s third grade class. I felt like I should be somewhere else, doing something else. It was a weird feeling. For the first time in my life, since I was old enough to work, I don’t have a job. I will get to go with the girls to school tomorrow and walk with them to their classes. I will get to pick them up. This year I will be able to volunteer and be part of the parent’s association. I won’t miss all of the little things because I am in class at the same time that they are. I won’t have to take a personal day to see a Christmas Concert or attend a Kindergarten Breakfast. It is a weird feeling. Perhaps this will be the hardest challenge for me in this big move to New York City. So often a job defines who we are. I am not sure how I really feel about it, I am sure it won’t even seem real until sometime in October. Right now it just feels weird. Not having a job is a HUGE adjustment, especially since you’ve been doing the same one for years, when I had to stop working because of an injury and eventually completely change my profession, I felt very weird too. But soon, the perks of being able to be with your girls for all the special moments will make the weirdness go away. And you can always go back when you feel you want to, good teachers are hard to come by and any school would be lucky to have you. You are too sweet darling, thanks for the kind words!! Wow … I remember that picture … getting all teary just thinking about it. I suspect the scene on the streets of New York will look a little different tomorrow morning. As for the rest … just think of it like a LONG summer vacation. And for the record, the only other time you didn’t start school in September (since you were 4) was in 2005, when Regan was born in July. Well, judging by the comment above i would say you’ve got your work cut out for you! Seriously, think of it as a sabbatical. Enjoy all the new things you’re doing, they’re both part of who you are and who you will be. Wife, mother, teacher, you’re all of these and yet not one of these words defines who you are. So have fun! Live, laugh, learn — and when all else fails, DRINK…A LOT! You do so have a job! If I were nearer I’d smack you in the head!!! You have the hardest job of all: being a mom!!!! been there ! Done it – you know i have and it was the MOST WONDERFUL TIME OF MY LIFE. Life is short and we take SO MUCH for granted and I truly believe our CHILDREN (and our dogs) define us. So love every aching minute you get to spend with them and helping them develop in the lovely ladies they will become. Keep up the good work Supermom! BUT! Having mum at home while I was at school was probably the best thing ever. You’ll enjoy it for sure and the girls will appreciate it. Love the blog, I’m blogging myself for school, hope to see you soon! I only just saw this…. a bit late. Hope you are both well Ron and Sandra. I live in the Hague and Zürich now. Doing nothing. Also no more Canadian snow storms or minus 30C temperatures. Jimmy J.